The term ‘super group’ is often tossed around like discarded confetti, but occasionally a trio of gold leaves settle on the ground. Sara Watkins, Aoife O’Donovan and Sarah Jarosz are three of the most faultless artists making music on the folk ‘n’ roots Americana scene. Their impromptu collaboration at the Telluride Festival in 2014 gave birth to a ‘super group’ with intent and time was taken out from busy individual schedules to play a series of shows under the banner I’m With Her. From personal experience, these shows were an extraordinary demonstration of gifted musicianship, both in terms of instrumental competency and vocal bliss. With this sure fire successful aspect in the bag, the next stage was to commit something to record and spread the word further afield. Nearly four years after that initial jam, SEE YOU AROUND has seen the light of day and verdict can be passed on whether the term ‘super group’ is justified. Of course, such terms are pure hyperbole and the efforts committed to this record do suggest how difficult it is to replicate solo success in a shared environment. Ultimately, many listens to this album has thrown up the conundrum of who owns a record and the very nature of collaboration versus independence. What struck me is how similar their voices are, great for harmonies, but a touch confusing when splitting the hairs should that be a desired activity. If anything, all three artists have retracted to the pure roots of their sound, in contrast to the last album from Sara Watkins where she impressively branched out in experimental mode. As predicted, the twelve songs skate along like intrinsic fine art in its purest form. Each artist appears to major on their selected instruments and the production ensures a spatial pallet for mandolin, fiddle, banjo and piano to spar with the vocals is created. While the natural synergy is evident, the search for a hook takes a little longer to grasp. Eventually, track #9 in ‘Overland’ comes to the mantle and uses its Americana overtures to attach itself to the coat hangers in your mind. Other notable insertions into the album involve a mid-placed instrumental titled ‘Waitsfield’, given a very live feel to the recording, and the previously unreleased Gillian Welch song ‘Hundred Miles’, given a vocally unaccompanied start before emerging as a credible album closer. There is a neat piece of acknowledgment in choosing a Gillian Welch song, as she was an important pioneer in making old time music cool at the turn of the millennium. Sara, Sarah and Aoife have definitely feasted on this in their several different formats, of which I’m With Her is likely to be a mere staging post in three very long and prosperous careers. Opening tracks ‘See You Around’ and ‘Game to Lose’ have been siphoned off as promotional pieces, but I keep being drawn to songs at the back end of the album (apologies for being in CD mode, vinyl lovers) such as those already mentioned and others like ‘Ryland (Under the Apple Tree)’ and ‘Crescent City’. The appeal to this album is its simplistic nature and the way three seamless talents have been blended. Its accomplished status is secured and it will be lauded by passionate advocates of the roots scene. Whether it breaks through a glass case into the wider world is open to debate, although it is pertinent to state that neither Sara Watkins, Aoife O’Donovan nor Sarah Jarosz have exposed any evidence to date of electing to compromise. Long may this remain, and let the mainstream come to them rather court popularity. Let us park any ‘super group’ analogy on one side for the summary, but not before a final thought of it possibly emerging as a ‘Trio for the 2010s’. SEE YOU AROUND will make a mark upon its release and if you want to compare the record with the stage show then plenty of opportunities to see them live are emerging. 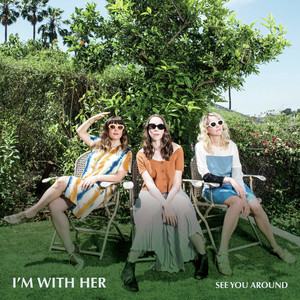 Sara Watkins, Aoife O’Donovan and Sarah Jarosz will be around for a very long time making fine music, but 2018 for them will be defined by I’m With Her.